Performing work in teams unites the potentials of individuals to form a strong company. Mul Hahar Projects jib cranes are efficient partners performing their tasks reliably and easing the load on the people who use them. With its comprehensive product range of jib cranes, offers flexible and cost efficient material handling solutions for any job in the workplace. Mul Hahar Projects jib cranes can be individually tailored – from the type of mounting or hoist to optional configurations for particular requirements – all produced to ’ high levels of quality. With the touch of a button, they can handle loads up to 6.3 tonnes precisely and effortlessly – whether mounted on their own pillars or on walls or columns. For loading machines, changing heavy tools or lifting work pieces onto tables for processing – with Mul Hahar Projects jib cranes, the lifting is easier, more efficient and safer. 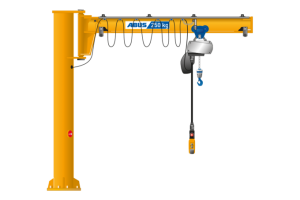 The pillar jib crane PS has been designed for freestanding installation on the building floor. 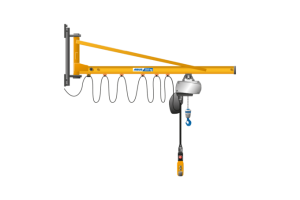 This workstation crane provides a slew range of 270° with jib arm lengths of up to 7 m and Safe Working Loads (SWL) of up to 1.0 t. Slewing stops allow you to adapt the slewing range to your individual needs. 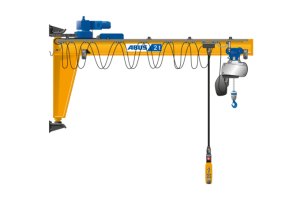 The pillar jib crane AS has been designed for freestanding installation on the building floor. This workstation crane provides a slew range of 270° with jib arm lengths of up to 7 m and Safe Working Loads (SWL) of up to 0.5 t.
The pillar jib crane M has been designed for freestanding installation on the building floor. This workstation crane provides a slew range of 360° with jib arm lengths of up to 10 m and Safe Working Loads (SWL) of up to 6.3 t. The low-built design allows high hook positions for optimal use of the available building space. 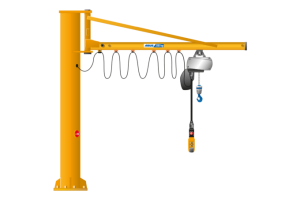 The wall jib crane PW has been designed to be mounted on a wall or column. 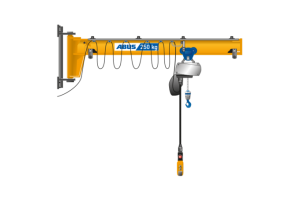 This workstation crane provides a slew range of 180° with jib arm lengths of up to 7 m and Safe Working Loads (SWL) of up to 1.0 t.
The wall jib crane AW has been designed to be mounted on a wall or column. This workstation crane provides a slew range of 180° with jib arm lengths of up to 7 m and Safe Working Loads (SWL) of up to 0.5 t.
The wall jib crane G has been designed to be mounted on a wall or column. 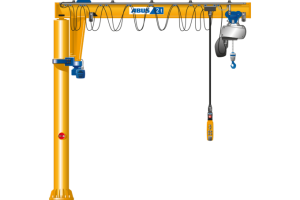 This workstation crane provides a slew range of 180° with jib arm lengths of up to 10 m and Safe Working Loads (SWL) of up to 5 t. The design of the wall jib crane VW enables the given building dimensions to be used to the fullest extent, so that the transfer of the load is achieved at the highest possible lift height. Copyright © MUL HAHAR Projects Ltd.